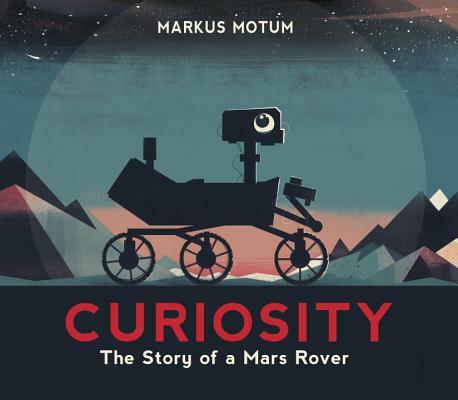 The Mars rover Curiosity narrates her own story in Motum’s handsome and engaging children’s book debut...The book’s large trim size and expansive scenes work in tandem to evoke the vastness of star-filled skies and reddish Martian landscapes. Originally published in the U.K., this accessible look at interplanetary exploration will appeal to a broad range of young space enthusiasts. Fans of the eponymous robot star of the film WALL-E will see a kindred spirit in this chronicle's narrator...Curiosity concludes with the thought that its wheel tracks may one day be joined by footprints. Here's hoping. The personification adds an appealing angle to this venturesome visit to Earth's closest planetary neighbor. Motum’s retro mixed-media artwork, in muted tones and stylish yet recognizable shapes, is a fantastic vehicle for this informative, inviting glimpse into an exciting STEM topic. Oversized format, with dramatic black backgrounds and futuristic geometric renderings, make this a good choice for classroom sharing, and text that allows an adult reader to charge ahead with the main information—or to linger over technical details—adds to its flexibility.